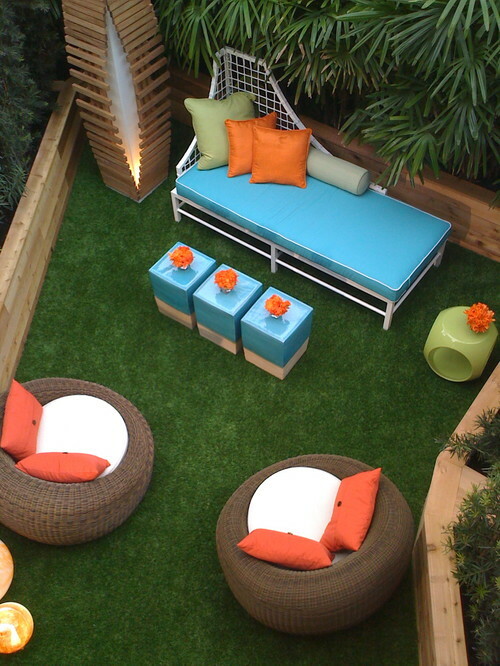 The installations below use interesting combinations of materials, colors and live plants to compliment the once tabooed fake lawn. In fact, they are so magazine-worthy that neighbors will surely turn green with envy. 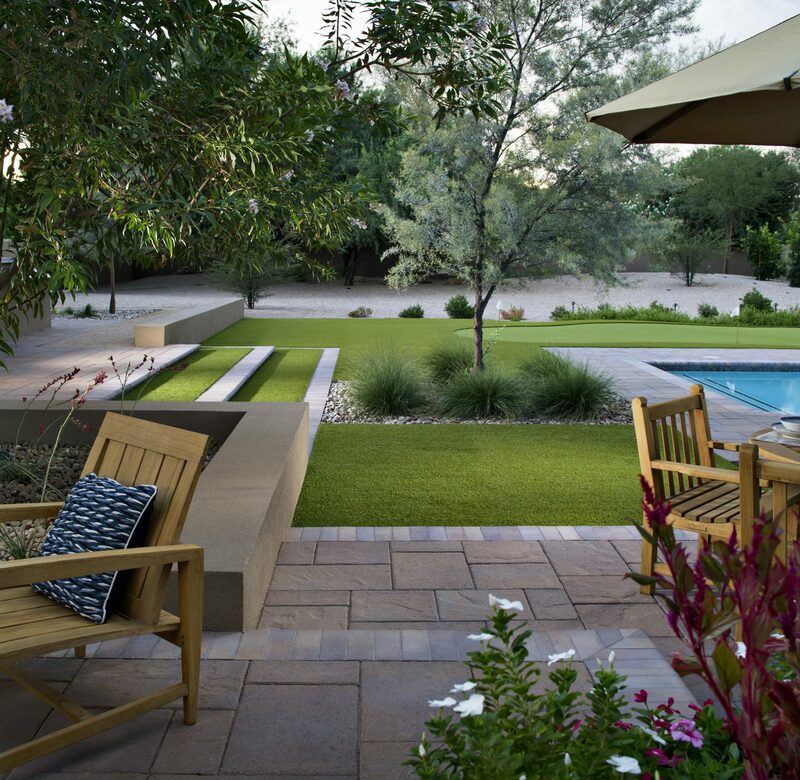 Remember that you don’t have to install a full lawn as artificial grass can easily be used between pavers, in side yards and other smaller applications. This home in Leucadia incorporates artificial turf between concrete slabs to create a look that seamlessly blends the driveway into the front entry to create a feel of openness. 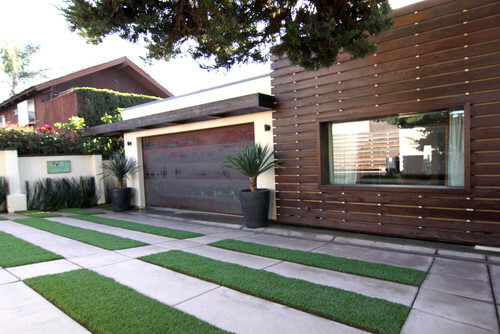 This Los Angeles home brightened up an otherwise shady patio with a small artificial lawn. 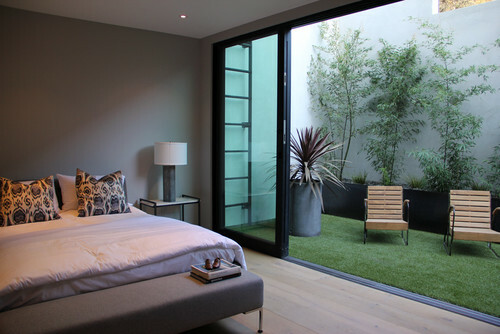 Not only is the grass soft to the touch, but it certainly adds a warm feel to this bedroom. Slippers or not, it’s easy to venture out into this comfortable space. 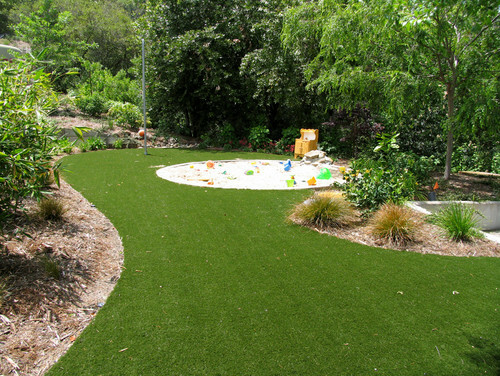 If the kids toss sand out of the sandbox, getting it back in is much easier with artificial turf surrounding the play area than real grass. Provided it didn’t just rain, sweep or blow the sand back in without it sticking to potentially wet soil. Let them play ball games like tetherball, pictured at the end of the lawn in this photo, soccer, catch and more. There’s a lot to look at here, right? 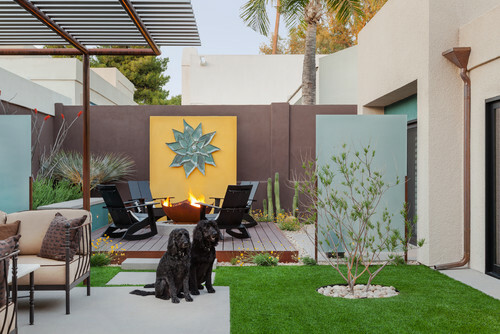 Aside from the adorable dogs on the concrete, the wood decking, yellow wall with sculpture, architectural plants and tree in the center of the artificial lawn provide a first-time guest with plenty of focal points. Who says that the lawn has to exist within a boundary? This playful design and modern seating injects youth into an older Beverly Hills estate. 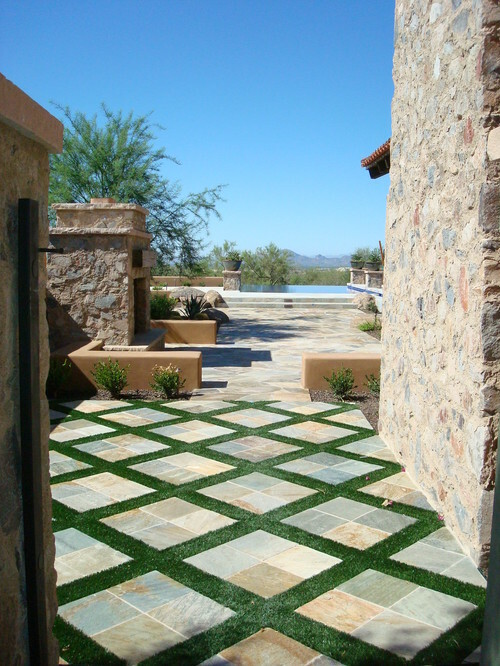 This Mediterranean design incorporates slate squares between strips of artificial turf to liven up a rustic look without much maintenance. Those needing a large strip of artificial turf may as well give it a practical purpose. 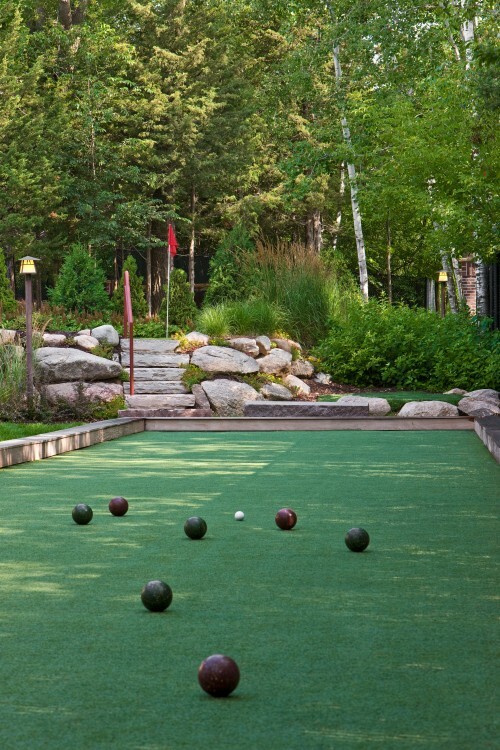 We’ve seen everything from bocce ball to putting greens to large chess boards. Artificial turf also isn’t always short like it is on a putting green. 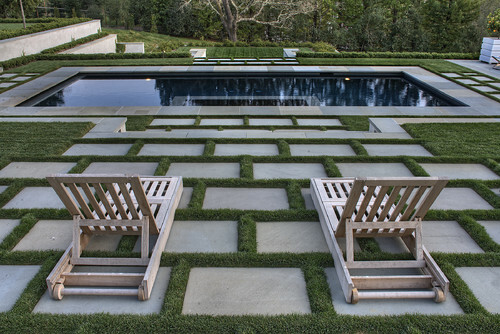 The lush grass between the concrete pavers in this photo provide a soft cushion under post-pool bare feet. Add interest by using a railroad pattern and soften the entire look by choosing wood patio furniture versus metal. 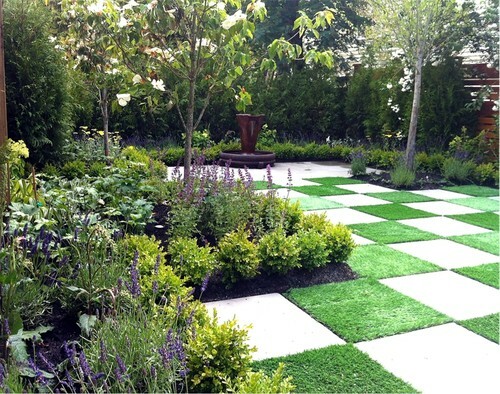 Give depth to an otherwise small backyard by incorporating a contemporary checker design, as displayed in this European-style garden with muted hues of greens and lavender. The tall trees and fountain provide a sense of privacy, as well. It’s hard to distinguish the living green from the artificial green in this photo. 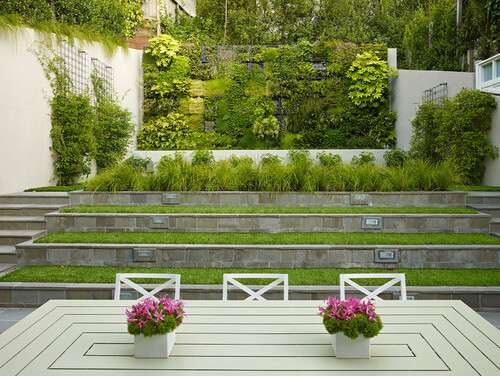 In this case, irrigating the grass on the steps here would have been difficult and, perhaps, wasteful so the owner opted for artificial turf even against a backdrop of a living wall and other lush greenery. The vases on the table provide a much-needed pop of color. Liven up an area of turf by adding color contrast. These homeowners choose a pretty bright blue accented with orange. Lady palms in the background add a tropical vibe to the space. 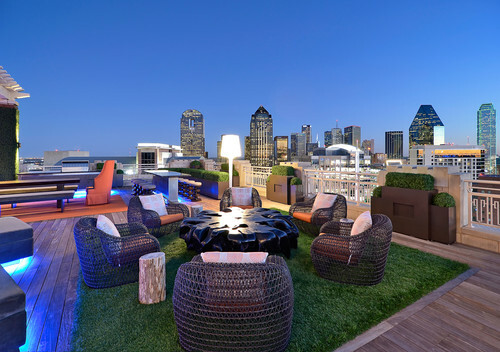 For those with city apartments, artificial grass in combination with modern container plantings is the perfect solution for adding an unexpected pop of greenery to an outdoor living area. There isn’t a need for any space to feel like a concrete jungle. Of course, the answer is that it depends on your geographical region, design and installation requirements. We do have a great deal of information regarding the cost of artificial grass that homeowners can use as a reference point. Have a look. Remember that you will save on your water bill over time, if you’re adding artificial grass to an are of the home that would otherwise be irrigated. And, there’s no need for a gardener to spend time mowing it either. In Southern California, live lawns require maintenance. Artificial grass also works for homeowners who travel and also rental properties. Maybe you have a dog and want an alternative to a lawn where he or she can play. We can also help with durable synthetic pet turf. Are you considering artificial grass? Do you have questions? Contact Install-It-Direct.